In the last couple decades, lean growth and feed efficiency have dramatically improved average pig weight for market. Productivity of the average pig farmer has increased, with pigs per litter and average market hog weights both increasing. A sure sign that a farrow-to-finish operation is successful is that pigs remain profitable at heavier market weights. USDA Livestock, Poultry & Grain Market News confirms this trend. In a recent National Daily Hog and Pork Summary report, the weekly average market weight of gilts and barrows was at 285.2 pounds. Down from 286.5 pounds the previous week, but up from 283.8 pounds a year before. In fact, the weekly average market weight has held consistently between 285-286 pounds during the first quarter of 2018, eclipsing the previous 5 year first quarter weekly average market weight range of 281-283 pounds. In swine production, it is important to account for all factors in the farrow-to-finish operation that affect carcass value and production cost when determining market weights. A farrow-to-finish operation, that is, the time required from birth to grow a pig to slaughter weight, is in the 22-26 week range. This begins with a farrow-to-wean stage of approximately 3 weeks or until the hogs are about 10 pounds. Sometimes a wean-to-feeder or nursery stage is used until the animal’s weight is approximately 40 pounds, or animals go directly to a finishing stage. 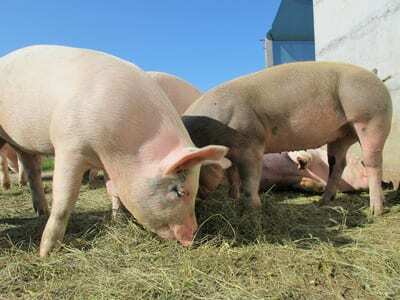 At the end of the nursery phase, the pigs enter a feeder-to-finish, or simply, the finishing stage, where at approximately 6 months they reach a desired slaughter weight of above 280 pounds, which will produce an approximate 210 pound carcass. A desired slaughter weight is the optimum market weight. The goal is to take the average weight for a group of pigs and maximize margin over cost. Meaning, the producer needs to identify the market value against the feed and facility cost associated with the farrow-to-finish operation to identify the optimum market weight, that is, the margin between value and cost. The point at which any further increase in market weight will not pay for the cost of feed and facilities will be considered the optimum market weight. 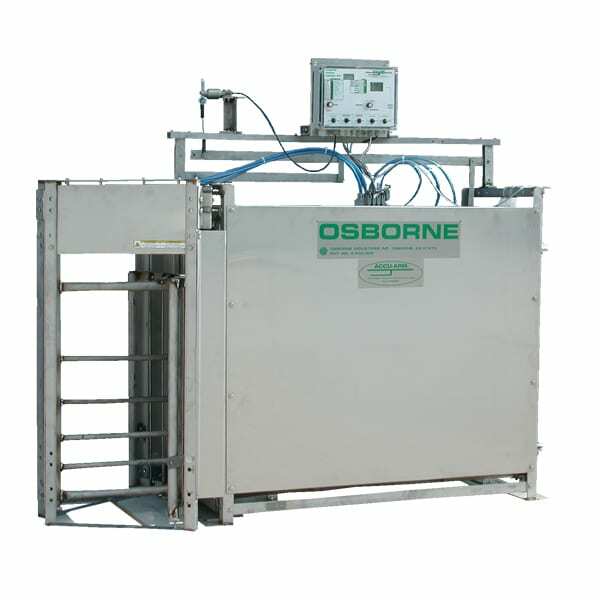 Osborne developed an innovative system of growth management for pigs entering the feeder-to-finish phase of operations. Specifically designed for finishing pigs in large pens, the Osborne Weight Watcher™ Growth Management System greatly helps to ensure swine production reaches optimum market value. Weight Watcher is much more than just an auto-sort pig scale. 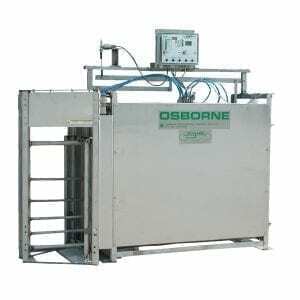 The Osborne Survey Scale sorts by pig weight to enable targeted feeding, and automatically sorts market hogs to cut sort loss and closely match packer’s matrixes. Feed and water are essential to the Weight Watcher System and are placed throughout the barn in designated “zones.” In one area, producers can establish the common feed zone with the Osborne Big Wheel Feeder, and drinkers can be balanced throughout the “water zone.” Animals can then freely flow from one “zone” to another. The Survey Scale uses this natural movement of pigs to automatically weigh and sort them as they pass through the scale. The Osborne Weight Watcher™ Growth Management System is easy to manage and can be easily retrofitted to any existing finishing facilities. The system is designed to mimic the natural movement and instincts of pigs as they moving from feed to water. It targets phase feeding, controlling growth, and thereby reducing the cost of feed. By controlling pig growth farmers are able to turn barns quicker and market more pounds at an optimum market weight.